Modular movements were not original to Yale, having been a feature of Holbrook's Automatic time lock of 1858. However, Yale's reintroduction of the modular design would be enthusiastically copied by makers and lauded by users, since it significantly reduced the time and cost of maintenance and repairs. Maintenance or repairs of built-in movements (single plate designs of the Yale model 1 as well as the S&G models 2 through 6) required a trained technician on site, whereas a modular movement could be replaced quickly by a layman with a clean, working movement and the problematic movement sent on to a central repair facility. 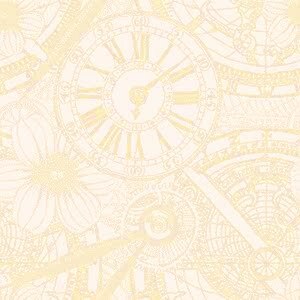 This practice reduced costs but also resulted in time locks with nonconsecutive movement numbers and greater temporal differences between their movement and case serial numbers. There does not seem to have been a production Yale time lock designated "Type A." No photos or engravings, no mention in the Yale period catalogs, no mention in any sales or production records, and no known examples what could be a Yale Type A, until recently. The type A was a test bed prototype and will be more fully explored in a separate section for the Type A. The first of the new Yale's were the Type B and Type C, which differed only by their release, the type B featuring a bolt dog and the type C having a bottom release for an automatic. 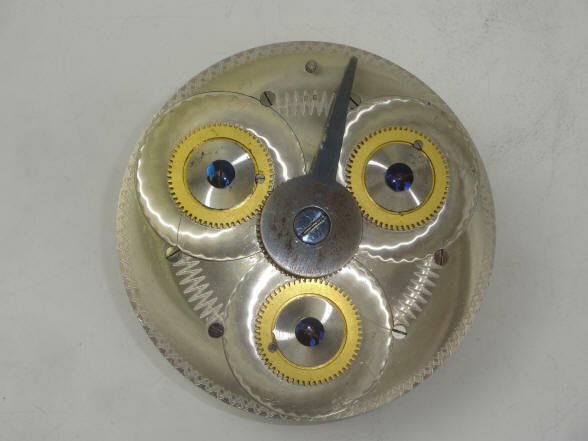 Both the Type B and Type C used three watch movements, with the three independent power springs wound simultaneously by turning the the movement mounting plate plate rim counterclockwise. While simple and convenient, there was no chance to correct for over winding. With individually wound movements, setting one for too long a period was only a minor problem. The user could set the other(s) for the correct, shorter period and the lock would release whenever the first movement ran down. Yale's instructions noted specifically that the user must "be careful when winding to turn the cylinder to the left to take up the recoil of the springs, and to leave the desired mark standing exactly opposite the pointer. But the inconvenience of over winding so high, Yale soon introduced an over winding correction pin hole at the six and nineteen-hour marks. Should the user over wind, a special pin was placed in the six hour hole. The dial would then be turned to the number of intended locked hours plus six, and as long as the pin was in place the lock would open when the movements ran down to 6 rather than 0. The nineteen hour hole worked in the same fashion. Production of the Types B and C was likely underway at least by the 1887 patent date, with sales starting thereafter, Yale's records show that eighteen Type B's were sold between December 1888 and June 1890 and fourteen Type C's between May 1888 and March 1889. Serial numbering for the Type B seems to go up to 44 and 40 for the type C, but these may not have been consecutive. All of the B through G series of locks saw limited production and today are quite rare. The Type B and C are particularly so because they were actively replaced by Yale after the introduction of their Type D and Type E. Only two type Bs are thought to be extant today and the one example of the Type C shown here. Yale's Type D and Type E time locks were introduced by May 1889 and were intended to replace the Types B and C respectively. These corrected several design problems in the Types B and C. Again the only difference between Types D and E was the release, the D having a bolt dog and the E a bottom release for an automatic bolt motor. While the basic features of the Types B and C were retained, Yale introduced substantive improvements in the Types D and E. Yale kept the simultaneous winding system but, notably, brought back a key-driven winding arbor. Now with a more accurate central arbor winding the three seventy-two hour American Waltham Watch Co. pocket watch movements, the six and nineteen hour over winding holes disappeared. 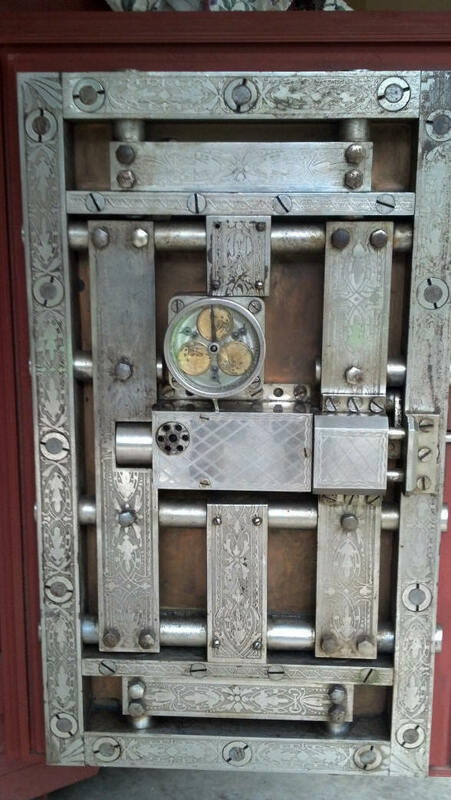 A "stop pin" was introduced in the Type D that could be pushed into block the time lock from activating, should the user want to close the vault door with just the combination lock, a feature first introduced on the Holmes Electric. Around 1890, production of the Types D and E changed slightly. Prior to this, movements had a bimetallic balance wheel made of brass and steel, gold plated up/down indicators, and no attribution to Yale anywhere on the lock. After about 1890 the balance wheels were plain brass, the up/down indicators had no plating, and a Yale attribution appears on the rim of the cover. Author's note: These changes are not in a strict order. There are examples where, for example the gold plated up/down indicators are on movements with the Yale attribution on the glass bezel. It should be noted that the Yale attribution did appear as etched lettering on the bezel glass of the Yale C.
Yale also made and sold a small number of these locks in a slaved pair making for a time lock with six redundant movements, also known as the '"Sextuple Time Lock" in recognition of the six redundant movements . At the time the industry's largest number of movements for a time lock was three. It wasn't until 1893 that Sargent & Greenleaf introduced the first four movement time lock, their Model O. That number, other than Yale's Sextuple has never exceeded four ever since. Author's note: Adding up all of the production numbers one comes to a total of 298 for all of the series B through EE time locks. I have seen an example of a serial number 252 stamped on the rear of the movement plate of a Type D with case number 28. Another D has 280 on the movement plate and case number 36. As stated before, the numbering may not have been consecutive resulting in a far fewer actually made. if one adds up the known sold units this comes to, 250 of which the Type E comprises 139. One should remember that with a very minor modification the movement plates were completely interchangeable across the entire line of locks, so if there is a plate with a number far in sequence from the case it is probably due to the active replacement campaign of the Type B and C's by Yale. It is also possible that instead of having the technician replace a troublesome movement he simply brought an entire movement plate with new or refurbished movements and replaced it, bringing the old one back to Yale for service. It is an easier process than replacing the movement. I have also observed that the movements always have a number 1, 2, or 3 scratched into the rear along with corresponding numbering on the movement plate, so apparently these were not completely interchangeable. This is not surprising since the initial runs of S&G's triple A and B, that company's first time lock models with modular movements, also had the same numbering. It would be a couple of years after their introduction in 1889 before true interchangeability would be achieved. I have yet to see any model of B through E that had consecutively numbered movements. One Type D has all three movements that differ by 51 or less between them. 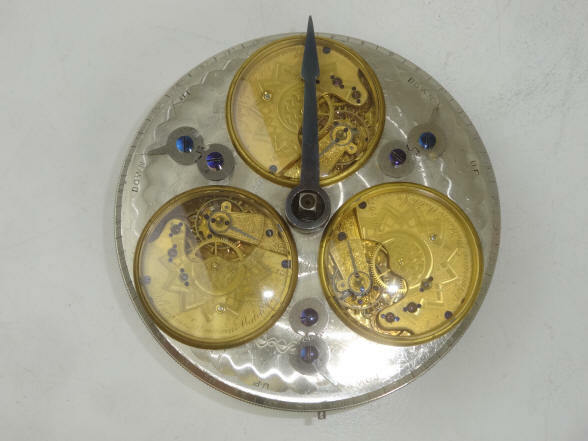 The fact that nearly all of the extant models have one or more movements with widely differing pocket watch serial numbers means there was a lot of servicing and replacement going on. 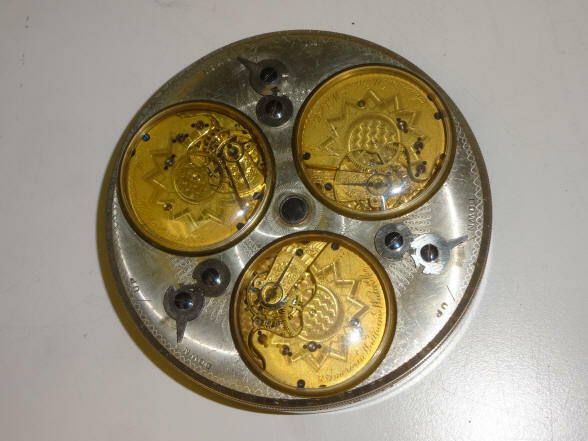 This may indicate that there were either problems with the movements provided by Waltham or some other component of the time lock causing problems for the watch movement. In conclusion, while the Yale Types B through EE were ground-breaking in their introduction of modular movements, the product line in terms of sales was not successful. Outside of the Type E, the remaining numbers sold was 111 across 8 models, an average of just under 14 units each. Their product life cycle was a short four years from 1888 through 1891. While there were other individual time lock models that had short product lives this is very short for such a broad model line. The main components. The B, C, D and E all shared the same movement mounting disk. 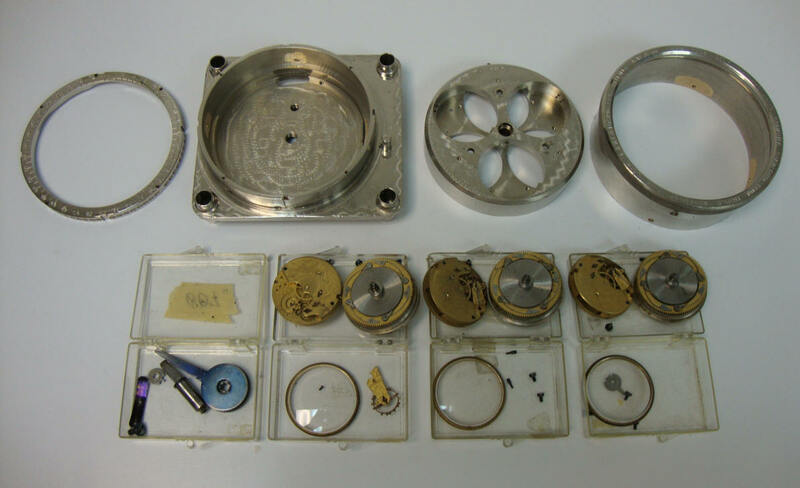 The first video compares and contrasts Yale's production models of the Type B, C, D and E time locks. The second shows the Type's B through E operational. 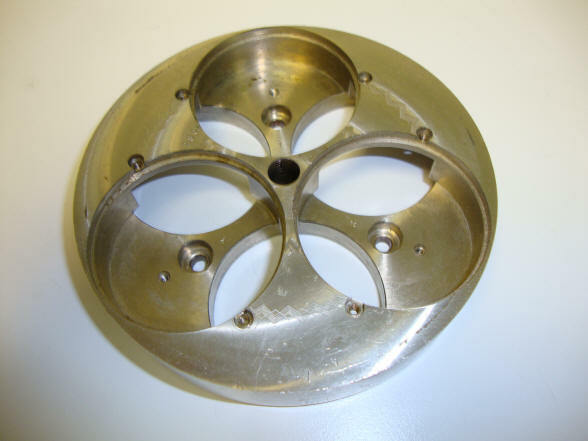 The rotating mounting disk of the B and C varieties. 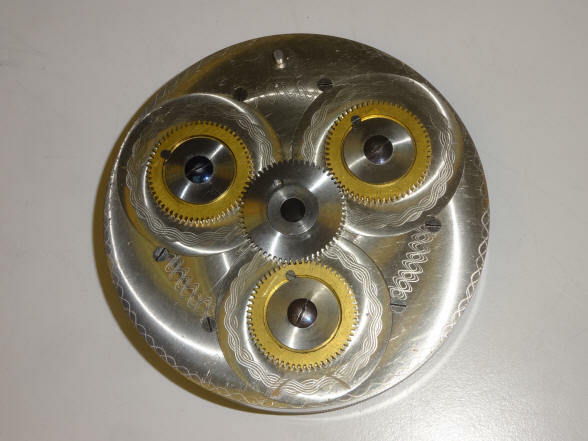 The center gear wheel is pinned to the inside center of the case, and so when the disk is rotated counterclockwise all three surrounding gears are simultaneously turned to wind the three watch mainsprings. The stationary mounting disk of the D and E varieties. In this type the mounting disk is pinned to the case and so is stationary. 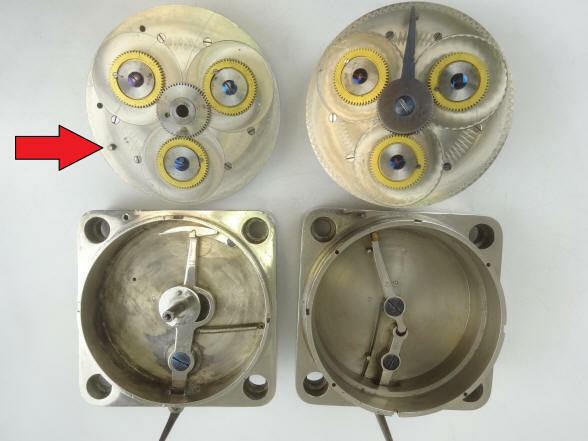 The three watch mainsprings are wound clockwise by a key from the front. The dial hand attached to the center winding arbor is used to read the setting time, first photo. A view of the obverse side. 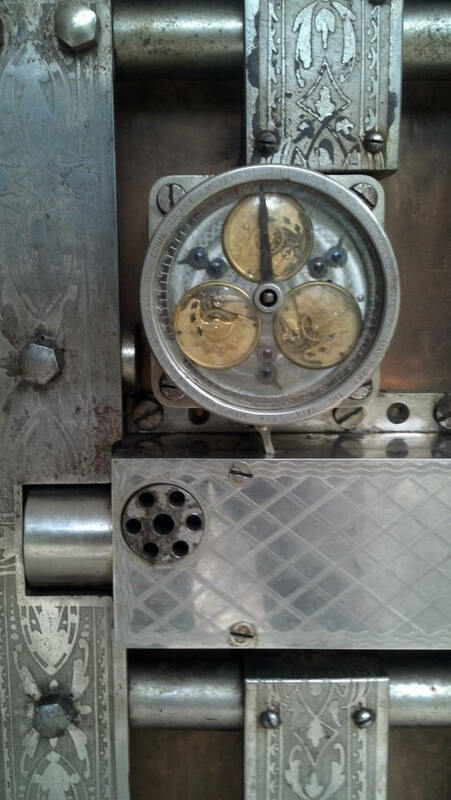 A center gear wheel, hidden behind the dog release wiper, meshes with the mainspring winding gears, second photo. Intricate machining of the movement mounting disk from the front and next, the rear. The holes in the front hold the individual Waltham size 14, model 84 movements. 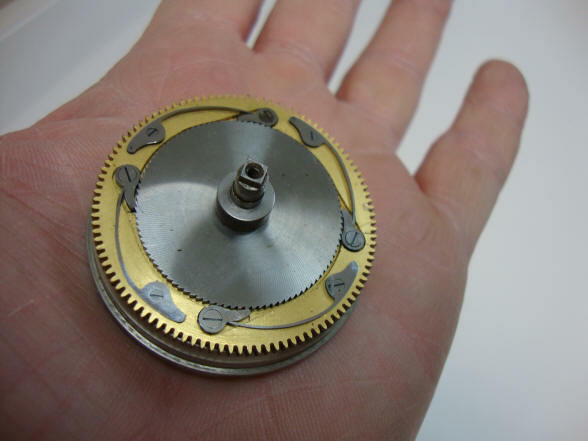 The rear of the disk had nearly identical holes offset from the from the front holes by 60° and held the main spring for each watch movement. 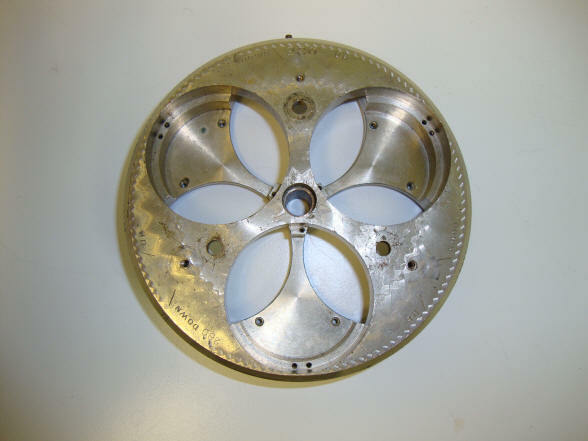 The first photo shows the two varieties of movement mounting disk as they relate to the C and E varieties, however the principal of operation is the same for the B and D models. In the C model the disk has a small pin mounted to the disk rim, here at the 8 o'clock position, red arrow, on the right the dog release wiper which engages a detent attached to the lever at the 11 o'clock position in the case below. 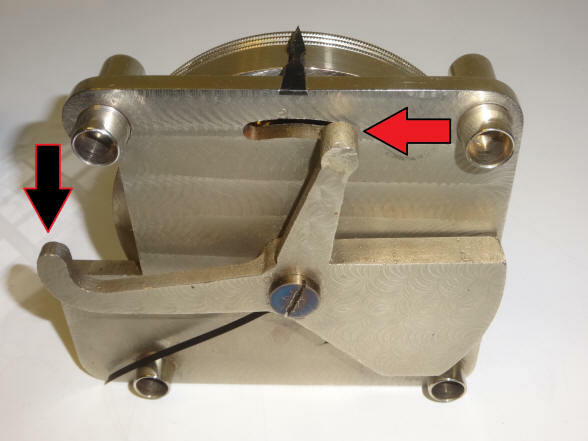 The second photo shows the bolt dogging mechanism of the type B and D. The pin on the rotating table in the B or the wiper lever on the D engages the lever pin that protrudes through the rear plate, red arrow, and that is connected to the push piece, black arrow, that pushes the sliding bolt dog adjacent to the case bolt hole. The Type E disassembled and ready for refurbishment. 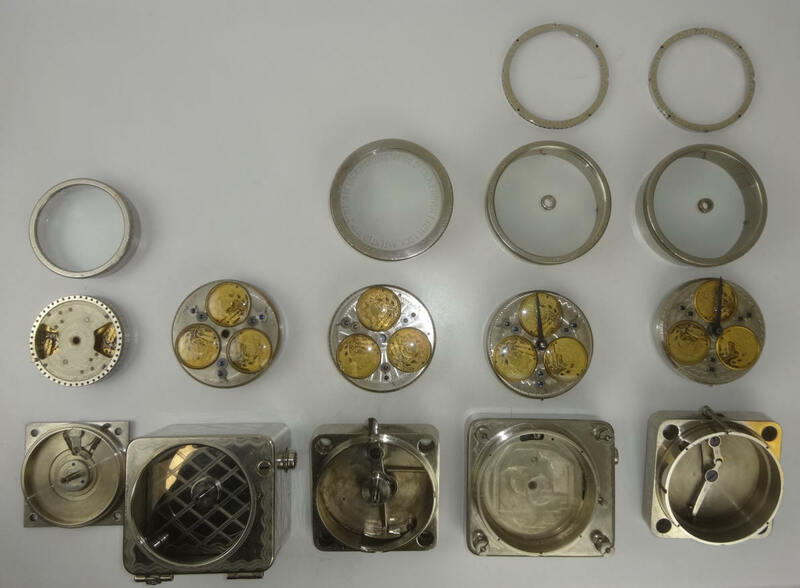 Each mainspring has four winding ratchets, the most this author has ever seen on a mainspring of any variety whether a time lock, watch or clock. This may be explained by the significant strength of the springs as exhibited in the video above. Unlike many conventional time lock movements whose springs are wound multiple times from their release to fully wound positions, these springs are only allowed one turn and so must be nearly at their full strength from the beginning.